The Ultimate Hitchhiker’s Guide is a collection of all five novels in the “trilogy”, nicely packed into a format that would allow one to use it quite nicely on interstellar travels as self-defense or how-to-guide. But it’s definitely not for people who want to leave the Earth and never come back as a lot of my acquaintances seem to want to do (I’ll count myself as one there too…), as it shows the Earth as a nice comfy little planet, that’s totally forgotten, almost impossible to find and improbable to leave it alive. I loved these books almost as much as I love the movie. And because I saw the movie first (and memorized everything Marvin said), then the characters appear as the actors in my minds-eye, so all the characters that aren’t in the movie are kind of dull and non-existent…But the books are clever and sarcastic and unless you have the Dictionary of Sarcasm nearby (I wouldn’t be surprised), it is just the necessary dose of acidic remarks on the Life, the Universe and Everything. Today I left a party saying I have to go and save the Universe -something that might sound familiar if you’ve read the novels. As far as the separate novels go – it’s either all or none, and the first one’s the only real option to consider here if you’ve liked the movie. I’m not quite sure where one novel ended and the other started, as it’s all a kind of blur faintly resembling the shape of a vogon that has had too much coffee ( if you’ve no idea how that looks like – it’s like a code-monkey jumping around happily because of discovering a fancy new operating system that tells them they’re on the other side of the world). To sum up – read it and some day you might feel the same way as the poor Arthur did while trying to get a computer to make him tea (the feeling being: I’d die for a cup of tea). When was the last time you felt like Marvin? (you know actually having a genuine people personality, and a rather cheerful one of those..)? 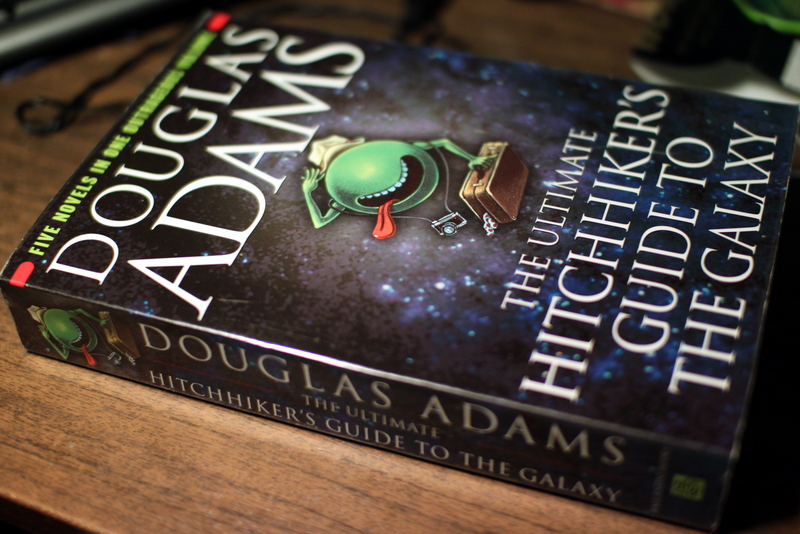 This entry was posted in Fiction and tagged book review, Douglas Adams, Hitchhiker's Guide to the Galaxy. Bookmark the permalink. Douglas Adams is someone I’ve heard about a lot as one of the better writers of science fiction. So when Flipkart made this set of all his Hitchhiker’s series available I readily went for it. And I was thoroughly rewarded for the trouble. This is an amazing series which makes one think about life in the Universe and about humanity through the eyes of Arthur Dent, the only surviving human after planet earth was destroyed to make way for a galactic superhighway. His zany adventures and misadventures through space make this a joyous ride though the story starts to lag a bit towards the middle of the third book. But it all ends with a bang. Highly recommended for space and sci-fi bufs and those who like British dry humour.